Smart phone. Smart guide. Smart traveler. We've just discovered a brand new and exciting service that is great whether you're a first time visitor or even if you're a seasoned traveler. 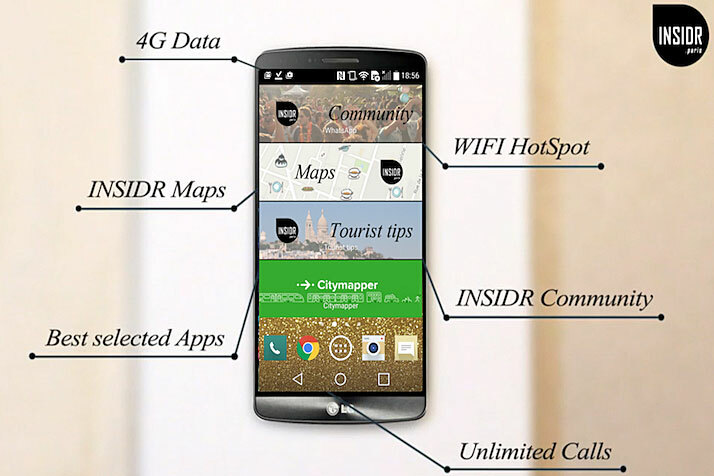 INSIDR service will provide you a fully loaded Smartphone for your stay delivered right to your apartment or even the airport. It will come loaded with the best Apps, exclusive deals and the ultimate digital guide to help you navigate Paris from the main tourist sites to secret places. Of course it will also include unlimited local calls, 4G data, and a Wi-fi Hotspot for all your electronic devices. The best part is that INSIDR provides a community of 50+ local Parisians who will share their perspective about culture, restaurants, and even shopping. It's like having a local with you! No more wondering if your phone will work in Paris, if you have the right SIM card or how high your phone bill will be when you get back home. We've found the perfect solution and it couldn't be any easier. For more information or to book your phone today, visit www.insidr.paris. Be sure and mention Vacation In Paris as the code when you book for a special surprise just for you. So much more than just a Smartphone and oh so simple! Mention Vacation In Paris when you book and receive a special surprise!